Define your app's path to success. 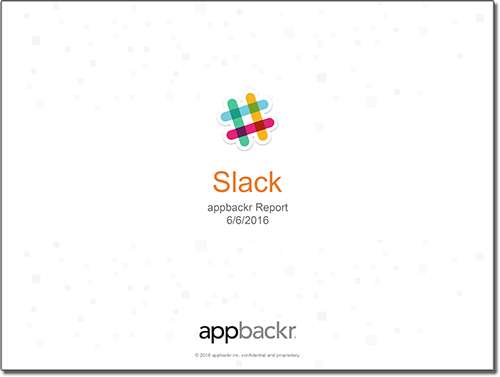 appbackr Insights merges appbackr’s data on over 1.8 million Android apps and our expert app analysis to create a one-of-a-kind report. Leverage our analysts’ research and observation to save days of effort for your team. Drive tech and integration development, build out social and editorial reach, and increase your audience with unparalleled data and evaluation on how the world sees your app from the inside out. Since 2010, appbackr has indexed and scored apps based on our custom Innovation, Digital Relevance, and Technical, Social, Editorial, and SDK evaluations.We compile those data points to deliver decisive, actionable planning for your team. Our team of app experts builds a substantial matrix to analyze your app and its impact. We look beyond the app with in-depth review of the brand’s editorial, social and web presence to look at the whole picture and see where the greatest opportunities lie. Power your effort with our data. Access a unique reference library on apps and app competitors. Attain only the most relevant information from a mobile metrics bank millions of data points strong. Track your apps, store, and appscores. Gauge competitor and cohort landscape. Manage your scalability. Plan prospective publishers and advertisers. Hand-pick quality apps and developers to feature. Improve in-store metrics. Increase customer social reach. Manage app performance with leading data and statistics on the stance of a mobile brand. Identify optimal partnership opportunities. Measure projects in social and technical aspects of app development. No thanks, run my free Insight Report with no cohort analysis.